Folks who have managed to snag Titanfall early from retailers are saying players who grab Xbox One disc copies of the anticipated online title this week will need to download a relatively manageable 840mb patch before they can play it. 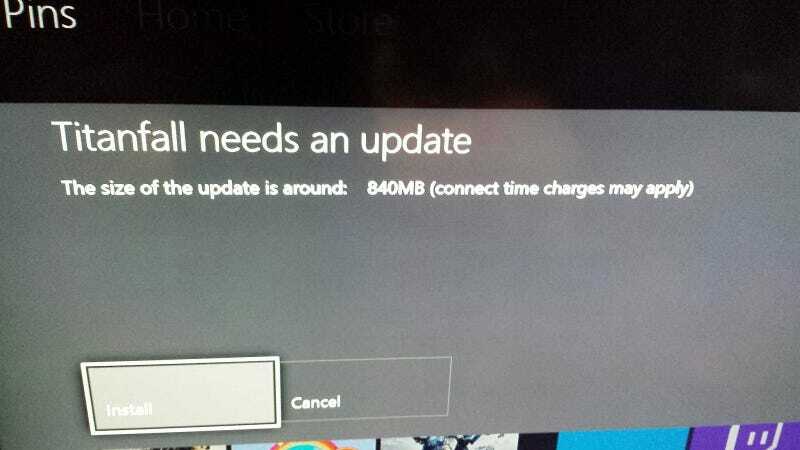 To be clear, 840mb is going to take a bit of time to download for a lot of folks, and hopefully the rush of people pulling it—or the full game, which is not available for pre-load through Xbox Live—early Tuesday morning won't slam the Xbox Live servers. It just could be worse. Dead Rising 3's 13gb patch set a strange precedent, but on Steam and the new consoles, ~1gb-or-larger patches aren't too surprising when they come down. So 840mb may not be so bad.